A radical plan to improve bus service in Brooklyn is a bit like the transportation version of the last scene of “Avengers: Infinity War” — half of the bus stops in the borough will have to disappear as if vaporized by Thanos. That’s a 40% gain. But removing half the stops would cause a lot of pain, too. Goldwyn said he and Levy know that consolidating some routes, combining parallel routes and eliminating stops is the third-rail of bus service — but said he answered to a higher goal: improving service in a borough where ridership has dropped close to 20% since 2008. Reducing duplicate service and overlays with existing subway lines, which planners say would improve speeds by 20%. Redesigning some streets to prioritize buses over parking, such as on Nostrand Avenue, which could be converted to a two-way bus route if one lane of parking was removed. More dedicated bus lanes could improve speeds by 11%. Installing pre-pay machines at more bus stops to speed entry. Eliminate some bus-to-bus transfer points. Goldwyn and Levy found that in New York, only 3% of riders transfer from a bus to another bus (most people with two-seat rides go from a bus to the subway). Eliminating many stops. The current average distance between stops — roughly 740 feet — would grow to 1,620 feet. “Yes, some of the time gained from faster buses would be lost by extra walking time, but the gain is larger than the loss,” Levy said. Politicians tend to protest any change along any bus line (looking at you, B82), but Goldwyn said agency engineers and planners see the benefits. After our first edition of this story was published, an MTA source did not throw the coldest bucket of water on the visionary plan, pointing out that the agency’s Fast Forward Plan already calls for redrawing the bus map in every borough (the Bronx is first). DOT and MTA are continuously working on new solutions to improve bus services for New Yorkers and we appreciate that civic institutions are also interested in enhancing the commute for thousands of bus riders. We are in full support of the MTA’s Fast Forward efforts and we are beginning to look at street design as part of the first bus network redesign in the Bronx. Successful bus route redesign will consider access to stops, transfer time, and the allocation of street space in communities, while concentrating more service on select high volume routes, adjusting stop spacing, giving buses more priority, and improving fare collection procedures. Story was updated at 11 p.m. on Wednesday to add in MTA context and at 11 a.m. on Thursday to add in the DOT. One issue with planning being dominated by white males is that there is a lack of attention on how crime impacts the way people move around. “Just walk a block” is perfectly reasonable in a some environments – but if that block is a hangout spot for a group of men prone to cat-calling and harassment, that one block can be a significant barrier to walking and transit use. Unfortunately, when planners look at a bus network, the block-to-block differences in safety are impossible to see from high up. Another solution is more police enforcement in problem areas but in most cities there aren’t enough police for this. I am very surprised to see the assertion that only 3% of bus riders transfer to another bus. Whatever study returned that conclusion should have its methodology re-checked. My experience any time I’ve considered using the bus is that many useful trips, other than those to subway stations, require at least one transfer, often more than one. The only reason that 3% number comes up is because much of our bus network functions as shuttles to subway stations, basically catering mostly to people going into Manhattan. Very little of it is set up to cater to people traveling entirely within their borough. As a result, people just don’t make those trips by bus requiring multiple transfers. They usually drive instead. It won’t go over here because it’s nonsense. Having people carry guns would make the entire City much less safe. This beats out the grade-separated bikeways as your worst suggestion. Crime is at a historic low; vulnerable people can walk just about anywhere. (I am not a woman; but as a man who stands only 5’5″, who is sometimes perceived as gay on account of my mustache, and who has experienced bullying and physical assaults, I never overlook this issue.) In those few areas where problems persist, the correct solution consists of increased police presence. The rationalisation of the bus network should not be held back by hypothetical scenarios. When I was growing up in eastern Queens (specifically Queens Village; I don’t recommend it), I could get to Jamaica and to school with just one bus. But many of my trips involved two buses. That’s how I got to Flushing, to the beach, and to various friends’ houses. Even now, living in comfortably urbanised Woodhaven, I see plenty of people transferring between the Woodhaven Boulevard buses and the lines that run along Metropolitan and Myrtle Avenues. The numbers are probably much higher in Queens. My educated guess would be at least 25%. Also, with faster buses, it is likely that more riders would transfer. Crime is at a historic low for reasons even criminologists can’t fully agree on. Whether or not this trend will continue is an open question. If it doesn’t, then I want people to be able to defend themselves. I used to carry around a knife back when the crime was high. I’m not a big guy by today’s standards either, at only 5′ 8.5″. The knife definitely prevented me from being a crime victim on several occasions just by preemptively taking it out. I only actually had to use it once, when I was accosted at gunpoint in a subway station. I stopped carrying my knife regularly by the late 1990s. At that point I felt safe enough to get along without it. Likewise, if I had a carry permit, I probably would no longer regularly carry a gun. I even feel safe riding at times and places I would have shunned when crime was at its peak, like Liberty Avenue at 2 AM. If/when crime picks up, people are going to start arming themselves whether it’s legal or not. Back in the bad old days about half of my friends carried around guns. This being the case, I would rather we legalize this practice, but have proper training requirements. I will agree with you that having amateurs who never fired a gun before packing will make things less safe overall. Having people with proper training carrying firearms will prevent a lot of crimes. Here I agree 100%. What Jass mentioned might be a problem, but it’s not an excuse to not improve the bus network. If it becomes a problem, then we use the police to fix it. Unpopular statement, but the perception of crime among women is overblown. Women are socialized to fear, although the overwhelming vast majority of men catcalling are not going to cause harm, only annoyance. Once you get more pedestrians walking along these routes, that perception of fear will decrease. Also, more men should shame the catcallers. One line I often use is “How would you feel if your mother or sister had this done to them?” That often shuts them up. I agree, in theory. But there is another thing to be considered. On one end the bus is competing with walking. On another, the bus is competing with the subway. Fewer stops would make it more competitive with the subway — unless it meant you had to walk just as far as to the subway. And it would make the bus less competitive with walking. On the other hand, this might make the bus more competitive with car services and app-based car services. Man shaming men among men doesn’t always end well, especially among strangers. To add to what I said earlier, although women are likely to fear being victimized, men are much more likely the victims of violence. That same cat caller may feel offended you said something to them, and proceed to assault you for making him feel less of a man. The best way for women to deal with catcalling is to ignore it, and if the guy comes up to tell him shes not interested in guys who do that and keep it moving. Girls from neighborhoods where catcalling is more common figure this one out before they even hit puberty. Suburban females who were shuttled around everywhere in an SUV growing up, typically not so much. True, but not all women view catcalling as harmful. Many see it as purely an annoyance, and some see it as reinforcing their self image/perception of desirability. I agree you need to assess the situation. The majority of times I did this was towards construction workers who for some reason seem prone to this sort of behavior. They’re not likely to assault me, and perhaps jeopardize their jobs, for a perceived insult. On a few occasions I was told to shut my f-ing mouth, which I did. And yes, sheltered suburban types are more likely to see this as a big deal. My sister mostly brushed it off, occasionally letting loose a few of her own insults. I do generally agree with the thrust of your argument, which is that victimization risk of women tends to be exaggerated. Even back in the high crime days, it was men who were far more likely to be victims of violent crime. Women often just had their purses snatched or stuff like that. My mom had a necklace she got from her parents stolen on the bus. The guy reached in through an open bus window. Being originally from the Bronx, I recall her relating the story to one of her cousins. She had made a positive ID of the guy at the police station but they never caught him. A few years later she showed me a small article in the Daily News where the guy turned up dead. To this day I have no idea if her cousin had something to do with it. He was old school Bronx, was likely at least semi-involved in the mob, although if he was only a few in the family knew about it. He may have taken care of business the old-school Bronx way. One of my cousins lives in the Bronx. The stories he comes out with sometimes defy belief. It’s definitely a different world over there compared to Queens. I take your point that a having more police around is not always a welcome solution. A police presence can create vulerabilities in communities of colour, as black men tend to be targets of aggressive policing and of police violence. Also, I appreciate your reminder that the instances of harassment that are never reported cannot be measured. Still, it would be hard to defend the assumption that that form of misbehaviour has remained steady or has increased at the same time as reported crimes have dramatically dropped. Finally, let us realise that a bus stop, no matter where it is located, will be a two-block walk away from someone. So eliminating a stop neither creates new conditions nor imposes an undue burden. In Morocco, for instance, 71 percent of men said women enjoyed sexual harassment, but only 42 percent of women agreed. Only 20 percent of Egyptian women said women enjoyed harassment, but 43 percent of men said they did. First off, I’m really shocked the numbers are that high. In fact, I’d say those numbers are probably lower than reality because many women won’t admit to it. And if this high of a percentage, even if it’s not a majority, actually claim to enjoy, then from a male standpoint it’s understandable. 80% might think you’re a jerk but of the 20% who don’t you might get lucky. Not sure what the figures might be here in the US. Interesting, nonetheless. I was half expecting numbers very close to zero. I really appreciate this comment! Thank you, Jass. Eliminate every single bus-to-bus transfer point. Is this a typo? I could understand bypassing some potential transfer points that are unlikely to be useful to many. But it generally makes sense to have buses stop at major streets, since that’s where destinations tend to be clustered – and since bus lines tend to operate on major streets, too, locally situated bus stops will lead to natural transfer points even if there was no explicit intention to create transfer points. Are Goldwyn and Levy proposing to deliberately avoid placing bus stops such that transfers are available, even where that’s the optimal location for the bus stops regardless of transfer opportunities? Goldwyn and Levy found that in New York, only 3% of riders transfer from a bus to another bus (most people with two-seat rides go from a bus to the subway). I have one trip that I used to semi-regularly take, Jackson Heights to Ditmars Astoria taking the Q33 to the Q69 that would work fine in theory with a bus transfer. The problem is that the Q69 is so unreliable (skipped buses in the schedule) that I would rather take the longer subway ride or use ridehailing on the occasions that I need to use it. If you have two reliable buses with reliable spacing, then it works, but otherwise relying on a bus transfer is just a recipe for frustration. I think it can be conceivable if you look at NYC as a whole. But if you remove Manhattan, then the percentage would be much higher. 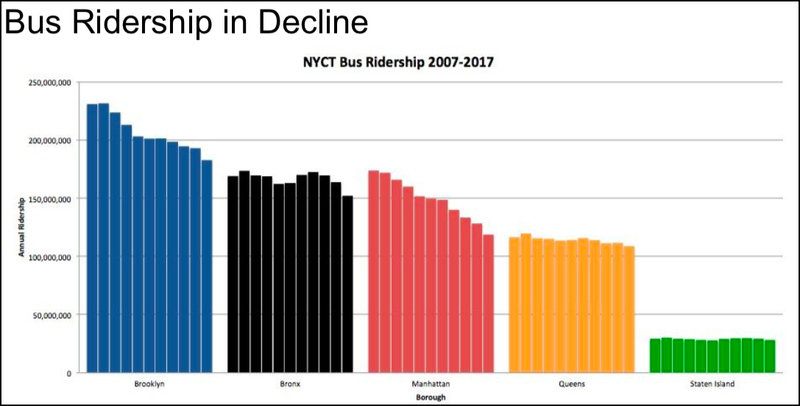 Those charts are interesting, and they show that the decline in bus ridership is not across the board. What is happening in Brooklyn and Manhattan that isn’t happening in the Bronx, Queens, and Staten Island? Yes “eliminate transfers” is a typo. To the contrary, our map makes sure that at every point where two buses intersect, there’s a transfer point. And 3% is mentioned in Zhan Guo’s dissertation, Transfers and Path Choice in Urban Public Transport Systems, p. 22 (Google it, it’s available for free online, I’m not linking to avoid offending the gods of comment moderation). It’s based on a survey from 1998. The MTA planner doing the Bronx redesign is a first-generation Colombian immigrant. Colombia has very high crime rates (esp. historically), and yet TransMilenio has even wider stop spacing than we’re proposing for New York. Rooted in Colombia’s experience, Simon Gaviria looked globally and found that higher crime rates lead to higher urban density as people cluster together. So in a high-crime area you’d want more people at fewer stops. Frequent service is the key to transfers. Transferring to a bus with service every 20 minutes risks a 20 minute wait. Simply using such a bus without a transfer has less risk of that, if you know the schedule and arrive at a stop accordingly. But you never know when a bus will get you to a transfer point. YESSS!!! I take the B57 and the number of stops it make is almost painful to watch. With a more reasonable stop frequency and a better fare payment system, buses can get their groove back. I found a link with more details about the plan. you know, if buses stopped nowhere they would go really fast! People leave subway and buses to go to Uber… you know why? for convenience and more proximity…. so removing stops is a killer especially for seniors .. by the way it would be useful to have a demographic analysis of bus riders..
the key to improving buses is to give them protected bus lanes .” The key factors behind delayed SBS buses are traffic congestion, bus lane obstruction, multiple traffic lights, and “bus bunching” (or, buses running too close together). ” Comptroller report , April 2018.
if we can do it for bikes we must do it for buses . Lanes need ot be protected only where their is heavy traffic congestion . I think you mean psychological harm, and I agree. It’s unfortunate that there’ nothing about frequency here. Surely this would lead to shorter wait times, which also reduces travel times, and makes it much easier to make transfer between bus routes. Buses only compete with the subway where there’s a subway going in the same direction and they only compete with walking for the shortest trips. Given that this eliminates duplication of subway routes, the former is going to be decreased. Given that this speeds up service substantially, there will be less competition with walking because the trips served will be geographically longer. Transmilenio is the equivalent of a subway system. If Bogota is like Mexico City, you can still board a local bus that stops on demand at every corner and feeds you into the BRT system. Thats my concern for these types of plans. Theyre great if the goal is to move buses, but that doesn’t always mean it’s the best choice for riders. In the era of door-to-door Uber service, telling people to walk further might mean they give up on the bus entirely. In Manhattan, the subway is frequently faster than ride-hail, and obviously cheaper, and yet look how many people are jumping into cars. Theyre willing to pay more AND take longer because it’s a door-to-door trip. One of the major causes of congestion in high traffic area is the ‘Door to Door” service that is expected from Ubers and Lyfts. Reducing the number of routes and stops should also impact the FHV services. There should be designated locations where it is absolutely not possible for an Uber to stop. Fine both the driver and the passenger; lanes will be less congested, and buses will run faster. Um, link to the study? The Houston bus plan offered a framework for folks to make choices about how to redistribute resources. Curious about how the authors would offer Brooklyn transit users an equivalent framework rather than making the decisions for them. Happy to see a Brooklyn-Battery Tunnel route! That’s such obvious low-hanging fruit–MTA’s own bridges and tunnels are incredibly underused for local transit–why should only express buses and cars use them? London, but it’s a no brainer. If buses are to play their part in making public transport an alternative to cars in cities then they have to appeal to everyone including those who have a choice, cabs or cars. In other words people who actually want to get somewhere in a reasonable time. Since you are apparently in contact with MTA planners, I suggest you ask for the correct number. There doesn’t seem to be a full fledged paper on this going into all of the details, somewhat to my surprise, or if there is one, I can’t find it. The sense I get – and the authors can correct me if I’m wrong – is that the analysis was conducted at an extremely high level, route-by-route at best. If there are any origin-destination studies, I’m not seeing them, and origin-destination studies are critical in a redesign like this. Brooklyn has a lot of major destinations – I’m thinking of hospitals and schools and the like – that have extremely high peaks not closely (if at all) aligned with the peak times for travel to and from Manhattan, yet the authors appear to be shifting to a uniform definition of peak that will leave many of these destinations drastically underserved. These destinations may require very heavy service at other times of day, perhaps relying on short-turns to provide enough service where needed without overserving the entire route. Finally, I don’t see any quantification of net benefit – how much travel time does the average rider save, or, better yet, what is the distribution of travel time savings/loss? Travel time savings is presumably the primary goal here, so this quantification needs to appear front and center! Increased frequency and increased reliability will tend to reduce travel times; greater stop spacing, if done well, will also tend to reduce travel times, but as you say there will be winners and losers. But increasing the need to transfer, on its own, tends to increase travel times, and while some elements here may make sense, I see no indication that anyone took the essential step of comparing current travel times with projected travel times under the new network layout. Don’t forget that many riders already transfer once (bus-bus or bus-subway) or twice (bus-subway-subway) – how many will need an additional transfer (bus-bus-bus or bus-bus-subway or bus-bus-subway-subway) to reach their destinations, which is onerous and, under current fare policy (which of course can be changed if there is a desire to do so), costs a double fare? What gives? With all due respect, this isn’t a plan – it’s just a small step up from lines on a map. There’s a lot more that goes into a plan than this. Has any of that work been done or is this really it? Is TransMilenio really the proper comparison? Doesn’t TransMilenio fill a role more akin in New York to the subway system than to the local bus system? Bogotá also has local buses, and my impression is (having never visited myself) that they have closer stop spacing. There was just too much news yesterday for one little teaser paragraph. So click that headline above and let's get started! Transit researcher Alon Levy outlines his prescription for aligning New York's commuter rail services with global regional rail best practices. Only by starting with a blank canvas can transit agencies produce benefits compelling enough to overcome political inertia.